This thing flies. The machine I installed it in is already positively loaded: It’s got Intel’s latest 6-core i7 processor, an Nvidia 1080 graphics card, and a whole mess of RAM. But this little stick of storage makes everything even faster. 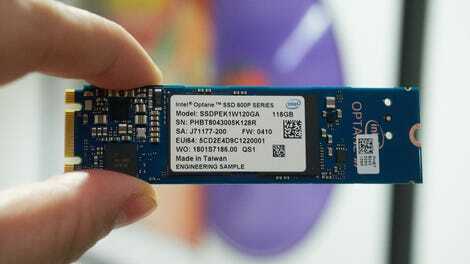 Intel’s Optane 800P storage is likely some of the fastest storage you can buy. It’s also incredibly expensive—think three-and-a-half-times more expensive than an SSD. Yet the Intel Optane 800P is hardly just another storage drive. Computing on the bleeding edge will cost you. Until now, if you wanted storage in your computer, you had to go with a traditional hard drive—the kind with a noisy magnetic platter inside, or you had to go with NAND-based storage. That’s the stuff you know as flash. It’s in your phone, your USB thumb drives, and probably in your laptop. It’s wicked fast. Optane is faster. Optane uses a whole new type of storage called 3D XPoint (yeah, it’s a mouthful of a name). If it’s ringing a bell, that’s because just last year, I sang the praise of another 3D XPoint-based Intel product, Optane Memory. That product helped speed up traditional hard drives making them as twice as fast in some cases. Optane memory needed an existing storage drive to actually work. Optane storage, the stuff I’m enamored with today, doesn’t need an extra hard drive. You pop it into an available M2 slot on your computer’s motherboard and boom—new blazing fast storage. And how fast? I’ve been using the Sandisk x400 SSD, which up until now has been more than fast enough for my needs. 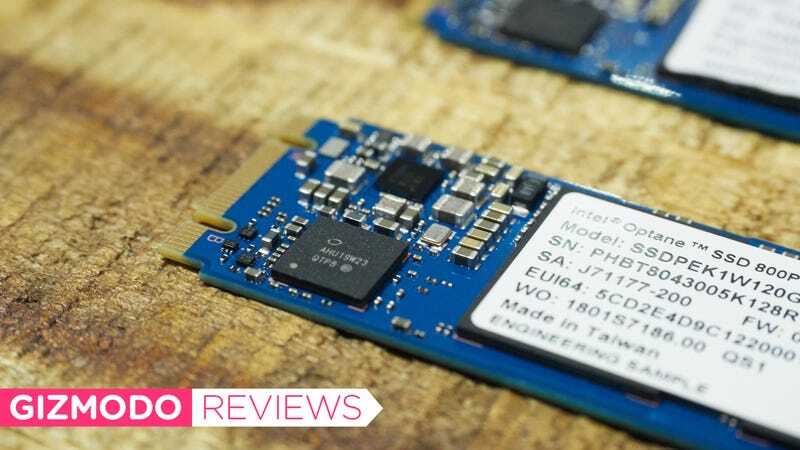 According to Tom’s Hardware and Anandtech, it’s a perfectly average SSD for today, so it seemed like an ideal comparison—especially if you’re sitting there with no clue as to what kind of storage is in your computer. If you’ve got a recent machine, it’s probably something like this Sandisk. I ran both drives through a series of tests (the computer build was, otherwise, identical) to get a better understanding of what the Optane 800P’s speed would look like in the average daily operations most of us are looking to improve. Optane Memory and Storage may look nearly identical, but they work very differently. Let me begin by saying that storage upgrades have traditionally been one of the best and cheapest ways you can improve a computer’s performance. If your computer is reading and writing data faster, it’s getting through its processes quicker. Still, not all processes are improved by a storage upgrade alone. Sometimes other things are holding it back. Thus in my test, Chrome opened in under a second on both the Intel and Sandisk drives. There was also less than a second difference when opening a big 4K video or Photoshop. Even opening Overwatch, and then loading a level, happened nearly the exact same time on both devices. The time it takes, in seconds, to open. Faster is better. While it didn’t offer any help in loading Overwatch quicker, it opened Mass Effect: Andromeda 3.52 seconds faster, and then loaded a level 5 seconds faster. Mass Effect is a much larger and more complex game than Overwatch, and it became clear that on larger and more complex tasks, the Optane 800P really starts to shine. When I ran Gizmodo’s Photoshop test, in which we batch convert and resize RAW image files into JPEGs, the Optane build got through the task 6.34 seconds faster. That was just 22 files. Imagine if you had to batch convert hundreds. Or imagine you have to open larger programs that have lots of resources, like Adobe Premiere. The Intel drive opened the program twice as fast as the Sandisk. Same with copying a 6.3GB file. Optane even booted up Windows 10 faster than the Sandisk, taking just 10.81 seconds while the Sandisk took 17.89. All those little instances of seconds shaved off can add up over time, which makes the Optane 800P seem like a very enticing upgrade. There is one caveat though: It’s very expensive. Optane storage is stuck in the same place NAND storage was stuck ten years ago. It’s simply too pricey to be the only kind of storage in your computer. The Optane 800P only comes in two sizes, 58GB for $130 and 118GB for $200. For the 118GB stick (which is the only one a rational human would really consider) that averages to $1.69 per gigabyte. Samsung’s 960 EVO series, which is generally considered some of the fastest NAND storage available, goes for $0.48 a gigabyte. The Optane 800P’s price means it is best for those old setups in which one storage drive handles the apps and operating system, and other, slower drives, hold all the data. But that doesn’t mean it can’t tackle all the storage duties. According to Intel, it’s already in conversations with every major laptop maker, and we can expect some kind of Optane storage-equipped laptop by the end of the year. Yet for most people, it’s still way too expensive to be reasonable as an upgrade today. Until the prices drop, Optane storage will remain a fantasy of the future. Intel Optane 800P is super fast. Intel Optane 800P is super expensive. It is available in M2 form only, so don’t try, or expect, to plug it into a SATA port. The headline of this post was clarified.